All schools, regardless of socioeconomic status, diversity and location, have been forced by outbreaks of school violence to confront how conflict is handled in our society. Schools have sought to find ways to deter violence and bring about peace in the hearts and minds of students. Project PEACE1, a partnership of the Pennsylvania Office of the Attorney General, the Pennsylvania Bar Association and the Pennsylvania Bar Foundation, is a peer-mediation, anti-bullying and youth court training program that enhances in Pennsylvania schools and communities the skills of non-violent conflict resolution and active civic engagement that are necessary for productive citizenship. This public-private partnership introduces dispute resolution techniques2first to elementary school students throughout the Commonwealth while promoting bullying prevention education in the schools.3Youth courts, where students serve as jurors, judges and attorneys, handling real-life cases involving their peers, are then introduced as students move into middle school. Youth Courts are an important element of Project PEACE. Originally brought to Pennsylvania by then Attorney General Mike Fisher in 1999 after the tragedy at Columbine High School, the program has continued to flourish under Attorney Generals Jerry Pappert, Thomas Corbett and Linda Kelly. Fourteen presidents of the PBA have endorsed the program and over the past thirteen years Project PEACE has brought its antiviolence programming, directly and indirectly, to nearly 200 Pennsylvania schools. All schools, regardless of socioeconomic status, diversity and location, have been forced by outbreaks of school violence, from bullying to school shootings, to confront the issue of conflict among school students. That initial look at tackling the problem of violence has led to a broader look at building involved communities, first at the school level, and then beyond. In this era of high stakes testing, when double periods of math and reading are taking the place traditionally reserved for social studies in the early grades and beyond4, Project PEACE also provides a valuable means of providing civic learning in the schools. Project PEACE works to reduce conflict and violence in Pennsylvania’s schools by teaching students how to discuss and mediate disagreements peacefully. It empowers children, who are still in their formative years, with the important life-skills that promote constructive communication, problem-solving, critical-thinking and self-esteem. Children become active participants in governing behavior in their classrooms by taking on the role of mediator and using the mediation process; they also impact their class and school climate by using the skills of conflict resolution that they learn to work out disputes on their own. With the help of neutral peer mediators, or through the exercise of learned skills by individual students, conflicts can be settled in a positive manner, benefiting the school climate as a whole. Project PEACE further works to limit violence in Pennsylvania’s schools by teaching young about bullying. By learning to distinguish bullying behavior from the kind of relational disputes that can be resolved through conflict resolution techniques, students are taught that bullying is an unacceptable form of peer abuse. Students learn to seek adult help when bullying situations become apparent and to look out for their peers who might be bullied. Students thus become the “upstanders”5that can positively impact the school community. As students move into middle school, Project PEACE expands its violence prevention by educating students about youth courts. Youth court, teen court, and peer court are interchangeable terms for an alternative disciplinary system for youth, either in school or community settings, who have committed an act that violates the norms of a school or the community. Youth courts train teenagers to serve as jurors, judges and attorneys, handling real-life cases involving their peers. The goal of youth court is to use positive peer pressure to ensure that young people who have committed minor offenses pay back the school or larger community and receive the help they need to avoid further involvement in the school discipline or juvenile justice system. Youth courts hear a range of low-level offenses; many handle cases that would otherwise wind up in Family Court or with school suspensions. All of the elements of Project PEACE — conflict resolution education, anti-bullying instruction and youth court training — provide alternatives to the zero tolerance disciplinary policies6that are still found in many of our schools. Project PEACE does more than provide an alternative discipline procedure. Project PEACE provides an extension and application of learning for the students involved in the day to day programming. Students learn conflict resolution skills that will help them in situations both inside and outside of school. The anti-bullying instruction underscores a national commitment to civil rights and dignity for all. Youth courts appeal to students because they process real student disciplinary cases which allow them to participate and contribute to an improved school climate. All of the Project PEACE elements have enormous potential to educate youth people about the justice system and develop academic, citizenship and socialization tools. For more information about Project PEACE, contact David Keller Trevaskis in the PBA Pro Bono Office atdavid.trevaskis@pabar.orgor 800-932-0311, ext. 2236. 1Project PEACE was originally known as Peaceful Endings throughAttorneys, Children and Educators; “Attorneys was changed to “Authorities” to recognize law enforcement and other community leadership being involved in local programs. 2All students are taught interpersonal conflict resolution skills, such as using “I Statements” and a cadre of students is taught peer mediation techniques to serve as peer mediators in the school or community. 3Seehttp://www.violencepreventionworks.org/public/index.page. The Olweus Bullying Prevention Program isa long-term, system-wide program for change involving individual, classroom, school and community components based on the research of Dr. Dan Olweus.Highmark Blue Cross Blue Shield funded significant Olweus training and research in Pennsylvania during thepast five years. 4Seehttp://articles.mcall.com/2012-04-13/news/mc-allentown-schools-history-20120413_1_social-studies-sixth-grade-plan-mathfor an article about this process in the Allentown schools. 5A play on the word “bystander”, one of the positions that students assume in bullying situations as Olweus describes in his bullying circle model. Olweus encourages students to not just watch but, however it can be safely done, to defend the student who is bullied. 6Are Zero Tolerance Policies Effective in the Schools? An Evidentiary Review and Recommendations,63.9 Am. Psychologist 852, 852(2008) (defining “zero tolerance” as “a philosophy or policy that mandates the application of predetermined consequences, most often severe and punitive in nature, that are intended to be applied regardless of the gravity of behavior, mitigating circumstances, or situational context.”). 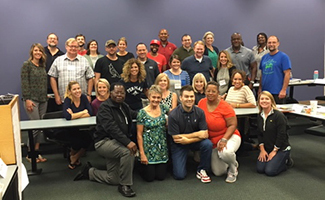 David Trevaskis, PBA Pro Bono coordinator and creator and original trainer for the joint PBA-Attorney General Project PEACE program kicked off the October 2018 Bullying Prevention Month with an Olweus Bullying Prevention recertification training in Greenville, S.C., on Oct. 2-4. Bullying is one of three parts of Project PEACE. Youth Courts, the third element, gets a big push on Oct. 19 in Harrisburg when Edgar Cahn joins Pennsylvania educators and lawyers for six free CLE sessions presented as part of the 65th Annual Pennsylvania Council for the Social Studies Conference. For more information, contact Trevaskis at dkt@pabar.org or 717-571-7414. This Project PEACE activity is part of the PBA's celebration of October as Pro Bono Month. Diversity law consultant Carl G. Cooper, center, is shown below with students from Manchester Academic Charter School (MACS) of Pittsburgh (students, left to right, are Kira Joseph, Zhaemar Washington, Dorian Boyce and Micah Baldwin), on April 10 at the PBAâ€™s 27th Annual Minority Attorney Conference in Pittsburgh, where Cooper was awarded the A. Leon Higginbotham Jr. Lifetime Achievement Award for his work promoting diversity in the legal profession. Cooper champions a diversity pipeline law-related education program at MACS and the school is in the process of implementing the PBA's Project PEACE Program. Project PEACE, a partnership of the Pennsylvania Office of the Attorney General, the PBA and the Pennsylvania Bar Foundation, is a peer mediation, anti-bullying and youth court training program that in Pennsylvania schools and communities enhances the skills of non-violent conflict resolution and active civic engagement that are necessary for productive citizenship. This public-private partnership introduces dispute resolution techniques first to elementary school students throughout the commonwealth while promoting anti-bullying prevention education in the schools. Youth courts, where students serve as jurors, judges and attorneys handling real-life cases involving their peers, are then introduced as students move into middle school. PBA Military and Veterans' Affairs Committee Chair Wesley R. Payne IV joined his former committee co-chair, Montgomery County Judge Cheryl Austin, for a celebration of Project PEACE (Peaceful Endings through Attorneys, Children and Educators) at Valley Forge Military Academy and College in Radnor, Pa., on Jan 20. PBA Pro Bono Coordinator and committee staff liaison David K. Trevaskis addressed the cadets on the importance of service and peacemaking, highlighting the work of the committee in providing legal aid for military personnel and veterans. A parade of the cadets was held in honor of Project PEACE, the anti-violence program jointly sponsored by the PBA and the Pennsylvania Office of Attorney General. View the program. Read Trevaskis's remarks. State Attorney General Tom Corbett (second from right) and PBA President Andy Susko (center) join with Project PEACE training participants.